Lights, Camera, Action! 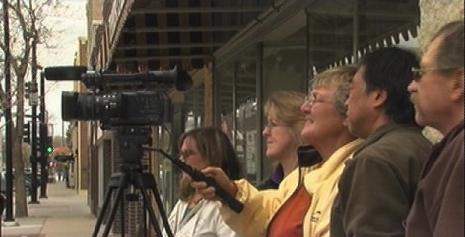 Wyoming Community Media presents its video production seminar. You’ll produce a short film during the class. Classes are held at the Hynds Building – 1608 Capitol Avenue. Learn the basics about how to operate a video camera, setting up lights and sound and the fundamentals of screenwriting while working on an actual film production project. Thank you to the Wyoming Arts Council, Laramie County Community College and Wyoming Film Office for their support. Click on the logo to enter the CCHEC page. Create professional videos without being a professional! Sign up for the Wyoming Community Media (WCM) Lights, Camera, Action! seminar August 27th through the Carbon County Higher Education Center (CCHEC). WCM and CCHEC are teaming up to provide the video production seminar during the Wyoming Film Festival in Saratoga. Participants will produce a short film during the class which will be screened at the Wyoming Film Festival on Saturday night August 27th. Also, there will be hands-on practical filming opportunities. The W2F is also has a need for panelists, speakers and filmmakers to be filmed for a documentary. Learn how to operate a video camera, the basics of setting up lights and sound and the fundamentals of screenwriting while working on an actual film production project. Check us out on facebook! The seminar instructor is WCM Executive Director and Producer Alan O’Hashi. He has been providing video – TV and Movie production services and training since 2004 and also produces the Cheyenne International Film Festival and The Shoot Out Cheyenne 24 hour film making festival. Thank you to the Wyoming Arts Council, Wyoming Lifestyle Magazine, Wyoming Film Office, and the Carbon County Higher Education Center for their support. These workshops are being offered for enrichment. No college credit will be issued. CCHEC reserves the right to cancel any classes without sufficient registration. We also need some extras during the parade for a shot that takes place in front of Marv’s Pawn Shop at the corner of 16th Street and Carey Ave.
Click on the image of the WCM - LCCC Lights, Camera, Action! workshop to watch Kyle Markley's story. KGWN TV reporter Kyle Marley was on hand for the WCM – Laramie County Community College Lights, Camera, Action! video production and storytelling workshop recently. Using video to tell a story can be done in a variety of ways. It can be used to make a commercial, a movie, or possibly a TV show. Create professional videos without being a professional! Download the catalog then sign up through Laramie County Community College. sound and the fundamentals of screenwriting while working on an actual film production project. Check us out on facebook! Optional: As part of a grant, earn a small stipend to help cover the cost of your class by serving as a crew member on an actual community video production project. Details of the dates and times of the community projects will be presented at the end of your workshop. Thank you to the Wyoming Arts Council, Visit Cheyenne, Cheyenne Downtown Development Authority, Plains Hotel, Wyoming Tribune Eagle, Wyoming Lifestyle Magazine, Wyoming Film Office, and City of Cheyenne for their support. These workshops are being offered for enrichment. No college credit will be issued. LCCC reserves the right to cancel any classes without sufficient registration. Find the latest edition of Wyoming Lifestyle Magazine (WLM) and see transmedia storytelling in action. On page 9 is the print version of the inauguration of Governor Matt Mead. You’re then led to a link on WLM Telvision (WLMTV) to watch a video news package of the day’s activities that started at the Cheyenne Civic Center and ended with hundreds of well-wishers at the state capitol building. WCM and WLM caught up with the Governor, Secretary of State Max Maxfield and Superintendent of Public Instruction Cindy Hill. Reporters also talked with inauguration activity attendees from around Wyoming. Watch the video by clicking on the Wyoming Lifestyle Magazine logo. It is entered in the Wyoming Film Office Short Film Contest. The top 10 entrants are determined by People’s Choice and the top ten judged by a panel of experts who determine the winner. Click on the image to view the movie and vote. It’s a small hassle to vote. Open the link, create a user name and password and vote for the film by clicking on a star below the video player. Watch the movie and make comments! Here’s a synopsis of the film: High-stakes gambling on Native American lands has been controversial over the years. Former Northern Arapaho Tribal Business Council Chairman Harvey Spoonhunter and Northern Arapaho Tribal Liaison, Wyoming Office of the Governor Gary Collins recount the hurdles the tribe had to jump, including challenges by the State of Wyoming in Federal Court. Tribal officials, including Wind River Casino Marketing Director, Jackie Dorothy, and Sky People Higher Education Finance Office Ken Smith talk about how this new form of economic development has changed the lives of tribal members and will preserve the tribal culture for generations to come. Tribal members John Brown and Lisa Yawakia tell their stories about how the new reservation economy has changed their lives.